A great way to tell if you are buying the finest freshest oil is to check to see if the oil has a date of harvest. This insures that the oil is fresh and still contains its health properties. The second way is simply the taste. Good Olive Oil has a unique fresh flavor unlike many bottled oils from the grocery store. Olive Oil is a seasoning as well as a food and should be considered a fresh addition to cuisine. Use and enjoy at its freshest and best. Balsamic Vinegars are a great compliment to Olive Oil, whether you use Traditional Balsamic Condimento or a flavored Balsamic. 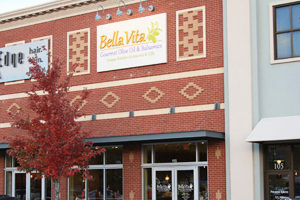 When buying Olive Oil and Balsamic Vinegar from Bella Vita Gourmet Olive Oil & Balsamics you can be certain that you are getting the very best. Our Olive Oil is kept in stainless steel containers (called Fustis) in a cool room which is the best way to keep olive oil fresh until you purchase the product. At the time of purchase you choose the size and flavors and each bottle is hand filled by one of our employees. This process take place after the order is placed whether on line or in the store. This insures that you are getting the best product possible for freshness and flavor.